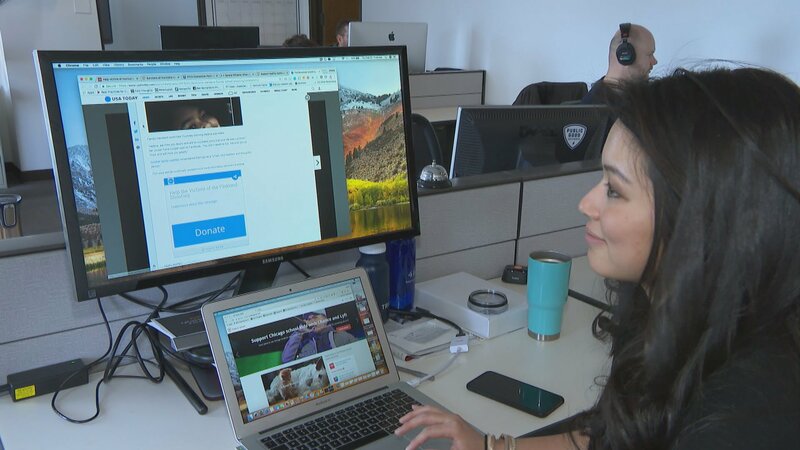 Whether buying tickets to a charity benefit or donating money online, technology and social media have made giving money to a cause you support much easier. But donating money or helping raise awareness for a cause could become easier still when that cause is attached to a news story. Tonight: How some news stories are being used as a call to action. If you’re checking out a news story online, you might have noticed something atypical. An opportunity to “take action” on an issue that matters to you, whether it’s ending child abuse, helping hurricane survivors or saving the planet. “In this particular article, it’s an op-ed by Serena (Williams), the ‘take action’ button here, at the bottom of the article, will point readers to our healthy moms and babies campaign,” said Amelia Chen of Public Good. The button comes from a Chicago-based company called Public Good. Through Public Good’s technology, the button can be embedded in the website of any of its media partners, from CNN to USA Today, and several here in Chicago, including WGN and the Chicago Reader. The technology analyzes the content of the news stories to determine if there’s a cause that a reader could “take action” on. “At WGN we actually get a lot of calls, emails, people asking us, after they see a story that really bothers them or is disturbing – they want to help. They want to donate, they want to do something, and this was a local, Chicago company, and they told us their idea, and we thought let’s try it, let’s just see what happens,” said Elyse Russo. Russo is in charge of digital content at WGN. She says the station initially started small with Public Good – only allowing the button to appear on a few choice stories. Once they noticed some response from readers, they went fully automated with the “take action” button appearing wherever the software placed it. If there’s no cause for action, the button stays hidden. “We want to stand by our community and this is just one way that WGN does that,” Russo said. Non-participation in the outcome of a story is a long-standing tenet of journalism – journalists avoid advocating for a cause, other than serving as watchdogs over the taxpayer or consumer dollar. But Public Good and its media partners say this is different. “It’s not in your face,” said Russo, “it’s at the bottom of an article, if somebody reads to the bottom of the page and feels a desire to take action they can. We’re not shoving it down their throats by any means,” said Russo. A “take action” button appears on a WGN story about the gun maker Remington on March 26, 2018. “A no-stance stand is a stand,” said Loyola journalism professor Don Heider, who says a “take action” button like this one is a very modest step away from tradition. “I think to always report a story, and then to just step back from it, and act as if we have no complicity in finding out what was the result and what could be done, is this working, and what’s working somewhere else – I think that’s irresponsible. I think that’s drive-by journalism,” he said. After clicking that button, the reader is taken to a new page. “Readers can do a couple of things. They can show their support and share this page and the article on social media; they can donate to this cause,” Chen said. They can share on social media, volunteer or send money. Those who do send money can get a look at the nonprofits dedicated to the cause, and, typically, the donation is spread out among all of them. Only organizations verified by local media to be on the ground working on the issue, like disaster relief or a school shooting, are included. And media organizations can decide whether to pick and choose which topics will see the button, or to be fully integrated, like WGN, allowing the technology to decide. “As an example, there are some regional locations like Arizona where immigration is a really hot, contentious topic and so they can choose to suppress ‘take action’ on any of those topics,” Anderson said. “The reason they’re doing it … is reader engagement. It’s the different between having your reader read a story, or read bad news and feel bad after they’ve read your publication, or read something and be empowered to take action and make a difference on it,” Anderson said. And an added benefit for media outlets is the feedback – analytics showing what viewers liked. For example, the top three causes that WGN readers cared for in 2017 about were crime prevention, animal protection and domestic violence. Fifteen percent of readers who saw the ‘take action’ widget – took some action. With 66 percent choosing to show support, 19 percent signing up for updates and 15 percent making a donation. Heider says Public Good’s growing partnership with media outlets is just reflective of the changing media landscape – and changing consumers. Public Good says it earns no income from either the media partners or the nonprofits. Its revenue comes from partnerships with private corporations on their cause marketing campaigns.